Fluids tend to move when there is an imbalance of surface tension – the force that helps you blow soap bubbles. Temperature can cause surface tension to change, with fluids generally flowing away from warmth. But get down to the nanoscale and the effect is reversed. The effect is down to an increase in Van der Waals forces, which attract molecules in the droplet towards molecules in the surface on which it is resting. In this case, the enhanced force pulls water molecules out of the droplet, causing them to evaporate. Although this force is present both on the hot and cold side of a droplet, the molecules on the hot side are more energetic so they can evaporate much faster. As they evaporate, there’s a lower concentration of molecules on the warmer side, so those from the cooler side start moving toward the heat. 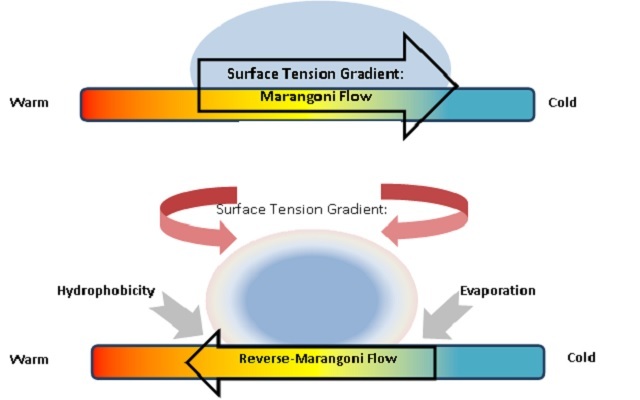 That localised cooling, which increases the local surface tension where the droplet touches the surface, causing the droplet to slide along towards the hotter region.